Today is Emeril Lagasse’s big day! The official release of his new cookbook Kicked-Up Sandwiches! Yah!!! Today’s recipe was a highly requested recipe from my Husband! He practically begged me to make it!! He saw the photo, read the ingredients and the next thing I knew we were at the store picking up the ingredients to make Emeril’s Chili Dogs!! I think my Husband loves Emeril!! I’m kind of jealous of that. 🙂 Now I didn’t eat one of these Chili Dogs because I am not a hot dog person, unlike my Husband who ate 3 of these for dinner and took the other three to work. I failed to mention that these are foot long dogs, not the standard hot dog. 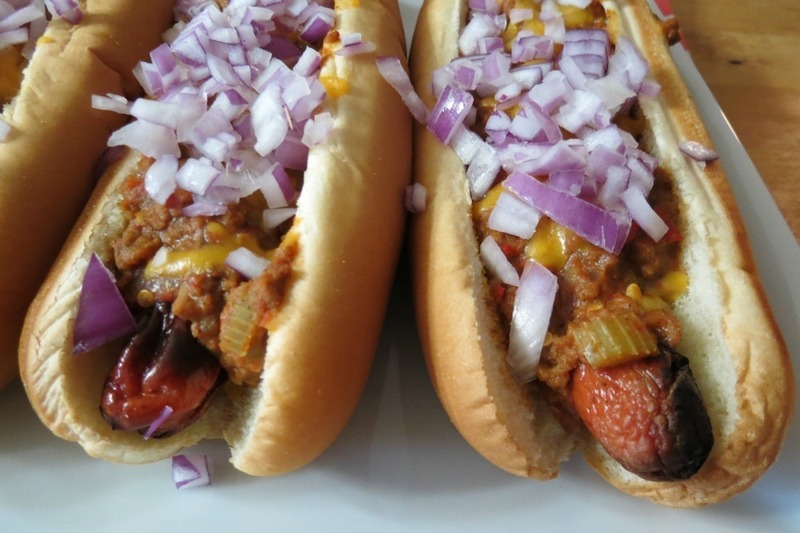 Now that I think about it, my Husband ate 3′ of hot dog with thick chili on top, oh and cheese too! Oh my gosh!! He is insane!!! I did however, eat the Chili and it tasted amazing! Filled with sweet roasted peppers, celery, onions, ground beef, chicken stock and more. It was so good!!! We had a little of the chili left over and I froze it, so I can sneak some for dinner one night! 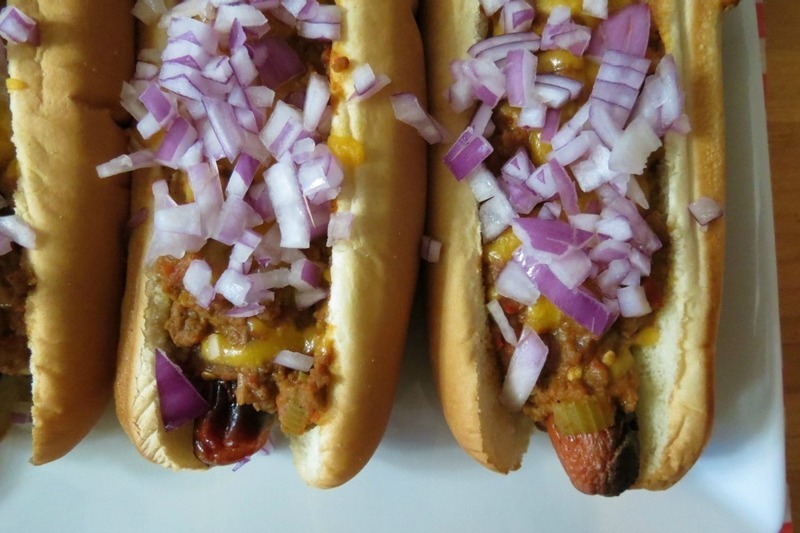 What I thought that was pretty clever with this recipe was that once you top your hot dogs with chili, you put the cheese on top and bake it for 5 minutes. 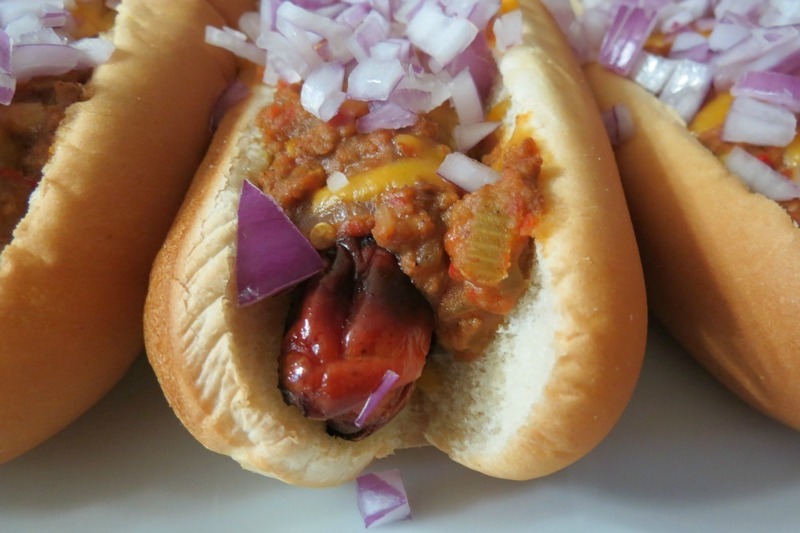 It made the buns sturdier to hold the Chili Dogs, plus the cheddar cheese was melted and gooey. I know your probably looking at the picture and seeing the burnt hot dogs sticking out from under the Chili, that is my Husband for you! He burnt the dogs, and he said he liked them that way! Who did I marry? I have to tell you Ladies, this was the first time in years that my Husband actually helped me with dinner. He chopped all the veggies for me as I made the roux. I have to say Emeril made another recipe that my Husband loved!! Thanks Emeril!! Since I can’t tell you the recipe for these dogs, I did however check out Emerils website and he had three hot dog recipes on there. None of them are like this recipe, but he had some creative dogs. I have to keep quite about the BLT hot dog that I found, otherwise I’ll be making them for dinner tonight! 😉 Next to hot dogs, that is my Husband 2nd favorite meal!! He could live happily just eating hot dogs and BLT sandwiches. 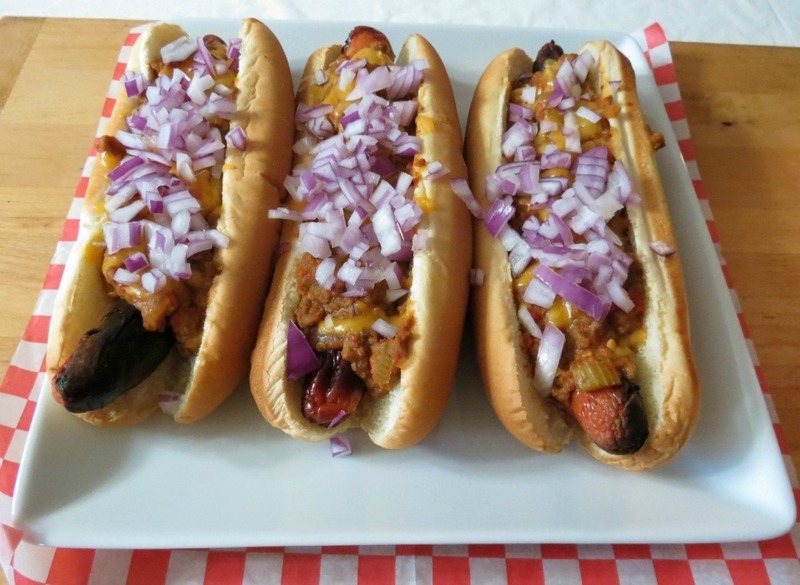 I had fun making these hot dogs for my Husband! I love to see him get excited over food and I love to give him massive size dishes, just to see his eyes pop! I some how find humor in that! lol I’m a weirdo! If your interested to see what other goodies are in the book you can go here. If you can’t wait, and your interested in buying the book you can order it here. Also, check out the Serious Sandwich pintrest page, there are new Emeril Sandwich recipes being added everyday. I only have two more recipes left so be sure to enter my giveaway! 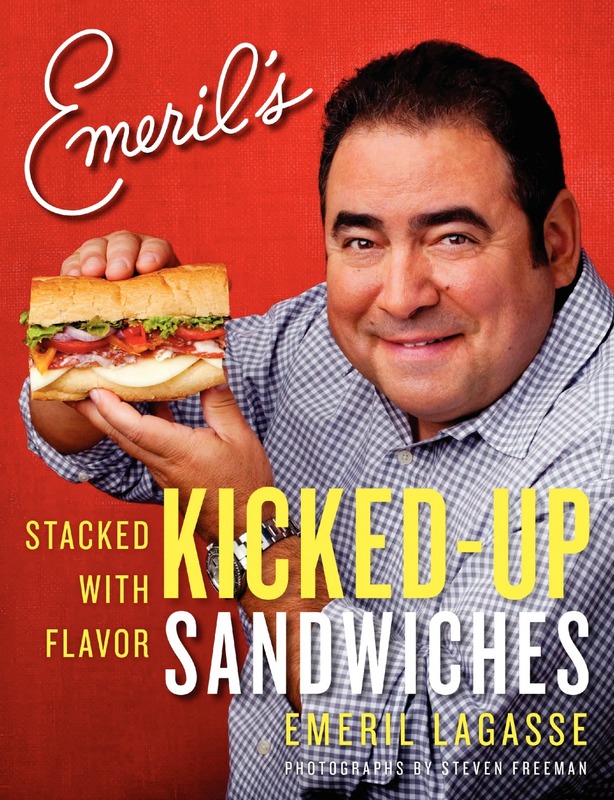 I’ll be announcing a winner on October 23rd which will be my last Emeril sandwich recipe. On the rare occasions I eat hot dogs, I want them burnt, too 🙂 This looks like a manly sandwich…so fun that your hubby requested them! Those look so good! Chili dogs are a Texas staple! Umm, yep … gonna have to make these after reading this! These look so tasty! I love a good chili dog! Mmm, I freaking LOVE chili dogs! And I like mine smothered with onions, too. Drooling over here, nobigdeaaalll. lol, these are my Husbands favorite meal!! Emeril’s recipe is perfect, even I liked the chili! !